This title is the first episode of a trilogy describing the lives of the Japanese people during WWII. As an author, I elaborated a plan to picture Japanese people during wartime three-dimensionally, in relation with other Asian and Western countries in three episodes, choosing three important phases as their backgrounds: the Conclusion of the tripartite pact with Germany and Italy in 1940, the attack on Pearl Harbor, Hawaii in 1941, and the atomic bombing and surrender of Japan in 1945. Each title is a completely detached entertainment story. The leitmotif of “Zero over Berlin” is the adventurous spirit and professionalism of a pilot of the old school. However, once a reader goes through the three episodes, another imposing motif “War and the Human” will be exposed. I am often asked whether the adventurous flight described in "Zero over Berlin" really took place. The fact is that it is completely fiction. There are two flights in history that prompted this novel. First, the long-distance flight between Tokyo and London by a Japanese two-seater airplane which lasted ninety-seven hours in 1937. Second, an A-26, twin-engined airplane flight which took off from Singapore for Berlin in 1944, during the war, which went missing. These two aviation events gave me the basic idea to write this book. I am also often questioned on whether the hero was modeled on any particular person and the answer is yes to some degree. Mr. Saburo Sakai, who was an ace pilot of the Japanese Navy, drew my attention when I was doing the research preparing for this title and I must admit Mr. Sakai's experience was partially reflected. Some people doubted there was a Japanese-American navy officer in those days. In this casting, I did have a pilot of mixed parentage as a model. His name was Kurusu Masatomo, Captain of the army air force. His father was a famous diplomat Kurusu Saburo, and his mother was a white American lady. Captain Kurusu was killed in battle defending the Japanese mainland in 1945. Although it may seem superfluous to say that this is a story about another aspect of WWII, the Asian point of view. 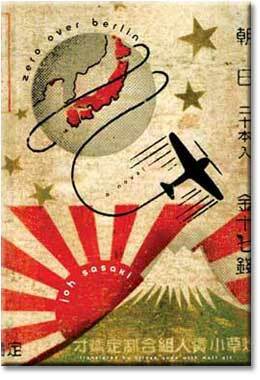 That view of the war through the eyes of the Japanese people at that time may be found interesting to Japanese youth, and also by westerners. Other than this WWII trilogy, I have written many stories in regard with the relation between Japan and other Asian countries during the modern ages. is now translated into Chinese by a publisher in Taiwan.